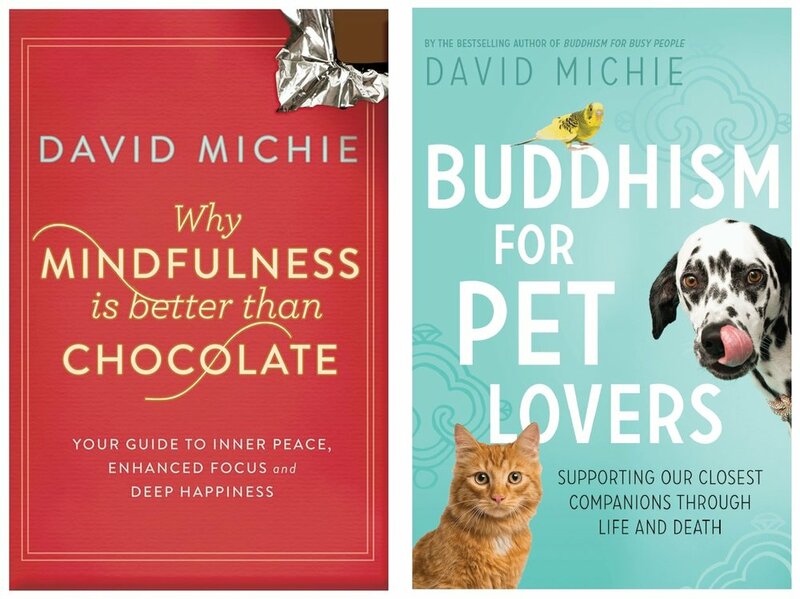 David Michie is the author of The Dalai Lama’s Cat series of novels, as well as non-fiction titles including Why Mindfulness is Better than Chocolate, Hurry Up and Meditate, Buddhism for Busy People and, most recently, Buddhism for Pet Lovers. His books are available in 26 languages in over 40 different countries. In 2015 he founded Mindful Safaris, leading groups to Africa - where he was born and brought up – for six day trips combining game viewing with guided meditations. As the many returning members of the Mindful Safari family testify, these extraordinary experiences help us reconnect with nature, as well as with ourselves, in a relaxed yet powerful way. I like to demystify concepts drawn from the Tibetan Buddhist tradition. In particular, mindfulness and meditation offer powerful tools for transformation of benefit to everyone, irrespective of their beliefs, or absence of beliefs. Offering clarity goes beyond expressing things in words which can be understood. Even in conventional reality our most engaging experiences usually go beyond words. How do you fully convey, in words, the taste of chocolate? The grief of losing someone you love? How it feels to be on the back of a Land Rover when a herd of elephant walk by, just a few feet away? Similarly, in matters of inner development, clarity is also not just about concepts, but about giving a real sense of how it feels, for example, to experience the true nature of our own consciousness directly for ourselves. What happens when we recognise that our mind isn’t actually the size of our head, and is actually boundless. How each one of us has the capacity to experience oceanic tranquillity, when we learn to become more effective thought managers. My wife, Koala, has also been a constant support during this journey. How fortunate I am to have someone who both supports me through the tough times, and also challenges my thinking when I get caught up in a loop. Self-discipline is also important. In particular, applying the seat of one’s pants to the meditation cushion. Even just a glimpse of the true nature of one’s own consciousness can be the most extraordinary game-changer. Tibetan Buddhists all share the same ultimate aspiration: to attain complete and perfect enlightenment to help every other living being attain the same state. While heading towards this panoramic objective, I hope to share whatever understanding I have about the nature of reality with as many people, in the most meaningful way possible. In particular, I’d like to inspire people to question the materialist assumption that brain and consciousness are the same thing. If they are not - and quantum scientists suggest that matter and energy co-exist – what are the implications for consciousness after we die? And if it continues, what are the implications of that? Sharing the Dharma, or Buddha’s teachings, has been my most meaningful success. I feel so fortunate to have found a way to channel the joy of creativity in a way that benefits others. I used to write thrillers, and when my London-based publisher pulled the plug on those I felt I’d lost everything I’d struggled for years to achieve. It was like being dropped into a void - all of a sudden I was on this intensive course in the cultivating non-attachment! It was out of that non-attachment that I wrote my first book about Buddhism – a non-fiction book called Buddhism for Busy People. Paradoxically, my Buddhist books have done far better than my commercial thrillers. When we focus on doing what we’re passionate about, and really don’t care about the outcome in worldly terms, we’re far more likely to succeed than if we’re burdened by expectations. I know my own experience echoes that of many others. Let go. Goal setting, preparation, and self discipline all have their place. But whether on the meditation cushion, working on a new book, or about to face a new audience, instead of getting caught up on the outcome I wish to achieve, the lesson I have most needed to learn is to let go. Just be me. I always have a chuckle to myself when I see self-development coaches talk about “modelling,” or following the example of someone who has achieved what you would like to achieve. These days, it’s most commonly applied to mundane success - but the concept is Eastern in origin and has its roots in the guru-student relationship. As such, my role models are my Gelugpa lineage teachers. The most famous Gelugpa lama is, of course, the Dalai Lama. Africa, especially out in the bush, is a place of home-coming and belonging, both to a where I was born and brought up, as well as the broader reality that every cell in my body comes from the earth, the water, and air. I also agree with Gore Vidal that the infinity terrace at Villa Cimbrone, in Ravelo, Italy, is the most beautiful place in the world. And I love the hyper-stimulation of London, where I lived for ten happy years – but only in measured doses! Just about anything from L’Occitane. The fragrance is just so South of France. 2018 sees our first Mindful Safari to Victoria Falls. Along with the game drives and meditations, we will be visiting the Falls, one of the Seven Natural Wonders of the World, and also enjoying an evening on a boat on the Zambezi River – there is nowhere more tranquil a place to watch the sun set than in this primordial and unspoiled wilderness. We will also be visiting a local school to help support disadvantaged children – of 195 kids, only 25 have exercise books. We’re able to do so much for them, with so little, and in so doing, also come to recognise the impossible good-fortune of our own extraordinary lives.